A growing number of employees work remotely rather than commuting to the office. Then, many entrepreneurs who start their own businesses do so from their home office. 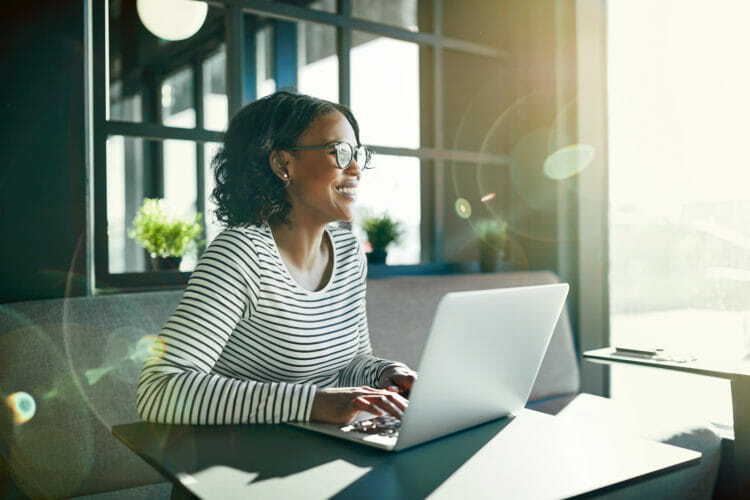 Even if you don’t work from home, you may still need a place where you can focus on paying bills, filing your taxes and completing other personal tasks. No matter your precise situation, you could benefit from having a productive workspace in your home. Here’s how to create the right environment to help you stay focused when working from your home office. It may be convenient to set your laptop down on the kitchen table and work through breakfast while the kids are getting ready for school, but it’s unlikely you’ll get much done. The noise and interruptions are probably more frustrating than they’re worth. Keep the TV turned off. If you listen to music, choose instrumental songs for background noise. Don’t try to work when the kids are at home, and you’re the one responsible for their care. When you’re working while someone else is watching the kids, close the door to your home office. Install a web blocker that prevents you from wasting time on social media or gaming sites. Keep your desk free of clutter so stray papers, extra books, and sticky notes don’t steal your attention. The more you minimize distractions and interruptions, the more likely you are to be productive when working from home. How often does your guest room get used? A couple of times a year, if you’re lucky? And do you really need an entire room dedicated to sewing, scrapbooking, or other crafts? These spaces present the perfect opportunity to introduce a productive workspace. For example, you might replace the traditional bed in your guest room with a wall bed, which folds up and out of the way to free up floor space for a desk. During the two weekends of the year when extended family comes to visit, you can temporarily push your desk aside and convert the home office back into a guest room. You probably won’t be doing any work while your guests are in town anyway. It may be tempting to work from the couch, but how productive can you really be with your laptop sitting awkwardly on your lap? This isn’t comfortable for long. Plus, it puts you in the middle of the action when the kids get home from school. Putting a computer desk in your home office is much better for productivity. Make sure it has all the features you need, such as a rollout keyboard tray, space for a phone and printer, and shelves or drawers for storing office supplies. For just the right results, you may want to invest in a custom built-in desk. This way, you’ll maximize functionality and storage space while creating a professional appearance, which is beneficial if clients ever come to your house. Comfort and productivity often go hand in hand. If your back or neck hurts, or you constantly have to change positions, you take yourself away from the task at hand. Keep your body healthy and your mind focused by using an ergonomic office chair. Manufacturers have made significant improvements in recent years to make office chairs more customizable. Features to look for include built-in lumbar support, armrests, adjustable seat height, and reclining capabilities. What do you need to get the job done? With fast, efficient equipment in your home office, your productivity will soar. Just be selective about what you invest in. For instance, do you really need a bulky color copier, or will an occasional trip to a local print shop suffice? Only pay for equipment you will use on a daily basis. Your work may be on your laptop, but to ensure your comfort when working for extended hours, it’s recommended that you type on a detached keyboard, use a mouse rather than a touchpad and work from a large monitor. You can hook up these peripherals to your laptop, or you can invest in a desktop computer. When you need to take your work with you, put it on a flash drive and transfer it to your laptop. If you don’t already have wireless capability, you may want to get a router so you can work online from anywhere in your home. Consider upgrading your network speed as well, so you don’t have to wait long for web pages to load. If you receive business calls at home, you’ll also want to install a separate phone line so clients can always get through. Look for a phone with speaker functionality or wear a headset to keep both hands free while talking. An important aspect of productivity is knowing where everything is so you can find items when you need them. The only things that should be on your desk are your computer equipment, a pencil cup, inbox and outbox, relevant papers, and anything else you use on a daily basis. Everything else should be stored away. Consider what items you store in your home office so you know what types of and how many built-in storage solutions you need. Often, it’s nice to work with natural light pouring into your home office. Other times, this creates a distracting glare. Give yourself multiple ways to light your workspace with window coverings, general lighting, and a desk lamp. As the sun moves across the sky, change your lighting setup to ensure you can always see what you’re doing and reduce eye strain when working at a computer. If your home office is in the basement or an interior room without windows, look into daylight-replicating light sources that provide full-spectrum lighting and change automatically as the hours’ pass. This helps your circadian rhythm stay on track and fends off adverse psychological effects, such as depression. While it may not be feasible to work in your garden, you can always add a little greenery to your home office. A small fern on your desk or ornamental palm tree by the door provides organic beauty and a breath of fresh air – literally! Many houseplants are known to clean indoor air, removing toxins that could impair your ability to concentrate. Even if you have allergies or a brown thumb, it’s nice to look outside while you’re working. Of course, if you find this too distracting at times, you can always close the shutters. For some people, a mild aroma can calm the nerves, soothe stress and increase focus. Potted plants, fresh smelling herbs and a vase of flowers are nice ways to add a subtle scent, but they’re not the only options. You can also run a diffuser with essential oils or light a scented candle. Lavender and jasmine are especially relaxing fragrances. Bay Home & Window offers the best custom storage, built-in desks, wall beds and window shutters in the Bay Area. These are all important aspects of creating a productive workspace in your home! For help designing and installing top-quality home office furniture at wholesale prices, please contact us today at 888-766-5919. We’ll help improve the beauty and productivity of your home office.